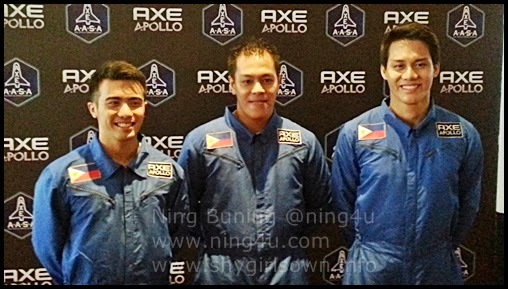 After almost eight months of selection process, the three-man delegation of our country for the Axe Apollo Global Space Camp namely Daniel Angelo Roque, Evan Rey Datuin and Ramil Santos are ready for the next level - Astronaut Training. Astronaut training at the Axe Space Camp in Orlando, Florida involves simulation space flight and real astronaut training. They will be joining hundreds of chosen participants from more than sixty countries and their representatives. They will all compete with 23 tickets to space- one of which is reserved for the best out of the three Filipino hopefuls. The Filipino representative should not only ready and prepared physically but also psychologically and spirituality. I think they should be holistically ready because the qualification and screening for the space trip is really tough. The Athlete Daniel Angelo "Chino" Roque is in lieu of Air Force Lieutenant Mario Mendoza, Jr, the one who withdraw from the competition to serve his military duties. He is a Psychology graduate and a football player of De La Salle University Manila. A 22 years old man working as a marketer and fitness coach. The Everyman Evan Rey Datuin studied at De La Salle University Dasmarinas. A 24 years old man who emerged victorious from competition as one of two finalist from more than 28,000 applicants in selection process. The Destined Dreamer Ramil Santos is the winner of the Axe Apollo Hyperdrive Promo, an electronic raffle ran by Axe to select a wildcard candidate for space camp. A 29 years old man who also joined the Axe Apollo National Challenges but did not pass the top two. An engineer with a Masters in Electronics and Information Engineering from South Korea. To follow their journey of our first Astronaut, visit www.axeapollo.com or join the discussion at Twitter with the hashtag #AxeApollo.